WASHINGTON — The head of the Environmental Protection Agency has broken months of silence about his frequent premium-class flights at taxpayer expense, saying he needs to fly first class because of unpleasant interactions with other travelers. EPA Administrator Scott Pruitt spoke about his flight costs on Tuesday in a pair of interviews in New Hampshire, following a first-class flight to meet with the state's Republican governor and tour a toxic waste site. Pruitt told the New Hampshire Union Leader he had some "incidents" on flights shortly after his appointment by President Donald Trump last year. "We live in a very toxic environment politically, particularly around issues of the environment," said Pruitt, who confirmed to the newspaper that he had flown first class from Washington to Boston before continuing on to New Hampshire. "We've reached the point where there's not much civility in the marketplace and it's created, you know, it's created some issues and the (security) detail, the level of protection is determined by the level of threat." Pruitt is the first EPA administrator to have a 24-hour security detail that accompanies him at all times, even at the agency's headquarters in Washington. He has also taken other security precautions, including the addition of a $25,000 soundproof "privacy booth" to prevent eavesdropping on his phone calls and spending $3,000 to have his office swept for hidden listening devices. Pruitt said he was not involved in the decision for him to fly first class. 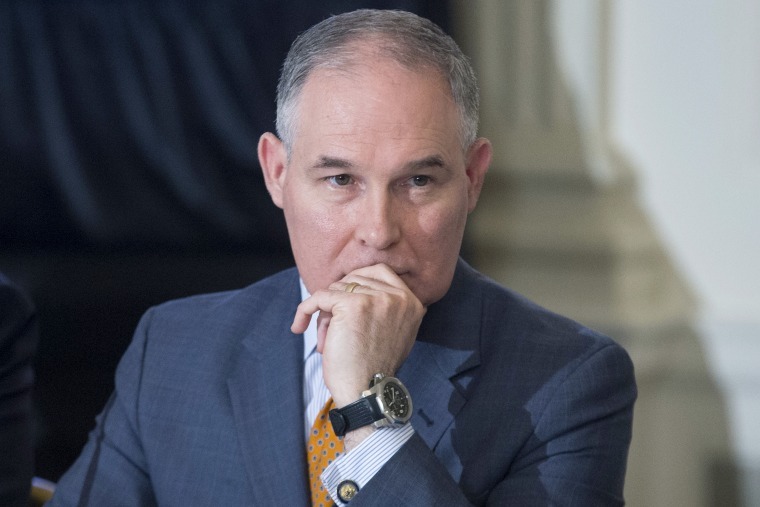 "There have been instances, unfortunately, during my time as administrator, as I've flown and spent time, of interaction that's not been the best," Pruitt told WMUR TV in Manchester, New Hampshire. "And, so, ingress and egress off the plane ... that's all decisions all made by our (security) detail team, by the chief of staff, by the administration. I don't make any of those decisions. They place me on the plane where they think is best from a safety perspective." Pruitt was asked about the issue following a Washington Post report on Sunday that detailed some of his travel expenses, including a $1,641.43 first-class seat for a short flight in June from Washington to New York City. Pruitt's ticket cost six times what EPA paid for his aides seated in coach. The Associated Press reported in July and again in December that spending on commercial airline tickets purchased for Pruitt indicated he was flying in premium-class seats. EPA's press office has repeatedly refused to comment on whether Pruitt was flying first class. Federal regulations allow government travelers to fly business class or first class when no cheaper options are "reasonably available" or if there are exceptional security circumstances. However, past federal audits have found that those rules have been routinely violated by high-ranking government officials under both Republican and Democratic administrations. The use of luxury air travel by members of Trump's Cabinet has been under scrutiny for months, after the resignation of Health and Human Services Secretary Tom Price in September following media reports he spent at least $400,000 in taxpayer funds on private jets for himself and his staff. A report released Wednesday by the inspector general at the Department of Veterans Affairs found that Secretary David Shulkin and his staff made "false representations" to justify his wife accompanying him at taxpayer expense on an 11-day European trip that mixed business and sightseeing. Records show Pruitt has taken at least four flights on non-commercial aircraft, costing more than $58,000. EPA has said all of those flights were necessary and pre-approved by ethics lawyers. EPA spokesman Jahan Wilcox did not immediately respond Wednesday to questions about whether Pruitt had been granted similar waivers allowing him to fly premium class or about the past security incidents to which Pruitt referred. Pruitt's frequent government-funded travel, which records show has often included weekend layovers in his home state of Oklahoma, is currently under review by EPA's internal watchdog. The office of EPA Inspector General Arthur Elkins said Wednesday it expects to release the results of its investigation by summer. Meanwhile, the White House's budget proposal for EPA released earlier this week seeks to cut $3.7 million, or 9 percent, in funding for Elkins' office. His spokeswoman, Jennifer Kaplan, said that would impair the ability of the inspector general to perform investigations like the one into Pruitt's spending. "Without sufficient resources, we would not be able to take on many discretionary audits and investigations that the OIG believes yield considerable value and return on investment," Kaplan said.